Diploma scroll with ribbon - vintage. 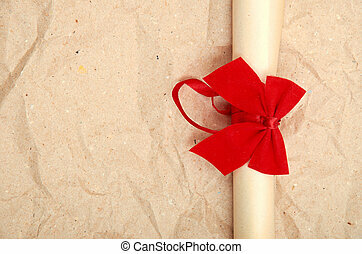 A parchment diploma scroll, rolled up with red ribbon laid at an oblique angle. 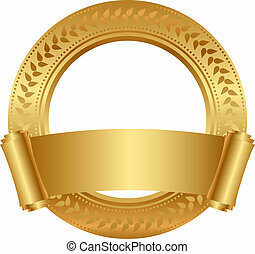 processed to give a vintage or retro appearance. 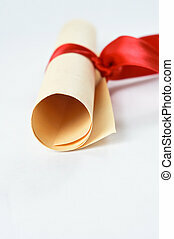 A parchment diploma scroll, rolled up with red ribbon laid at an oblique angle. 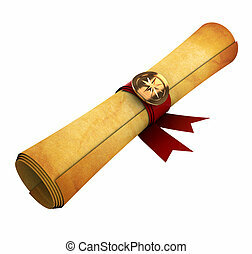 Processed to give a vintage or retro appearance. 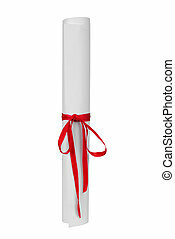 Degree Scroll with Red Ribbon and Diploma Medal Isolated on White Background. 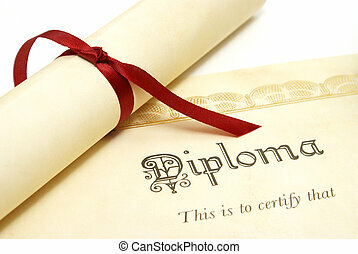 A diploma represents a high achieving student. 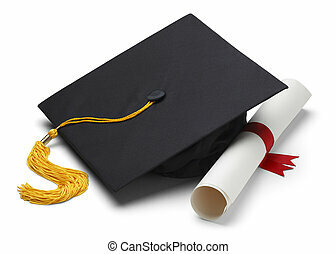 Black Graduation Cap with Degree Isolated on White Background. 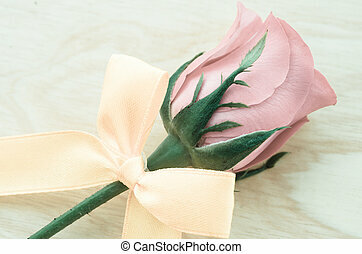 vintage rose with ribbon on wooden background. 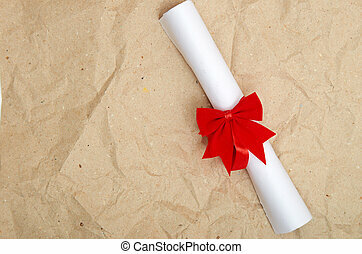 Close up of a rolled up diploma scroll, tied with a red ribbon. 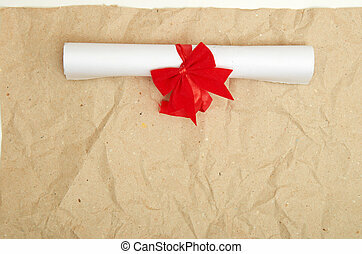 A rolled up parchment scroll, tied with a red ribbon to suggest graduation diploma or award. 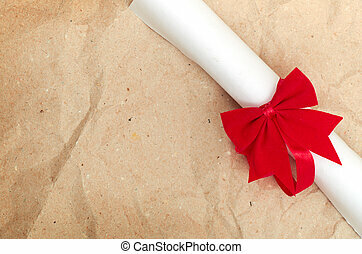 A rolled parchment scroll, tied with red ribbon, next to a black mortarboard. 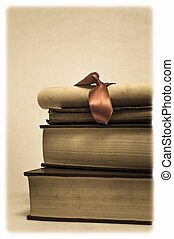 Low saturation, brown hues and vignette for retro or vintage effect. 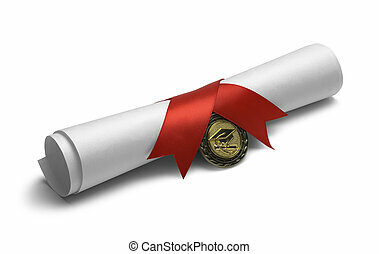 Education or success concept. 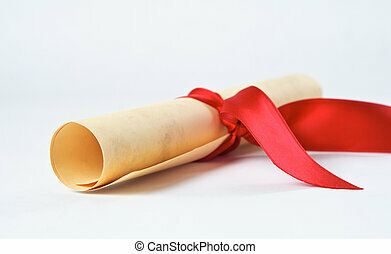 A rolled scroll of parchment coloured paper, tied with red ribbon to signify a diploma or award. 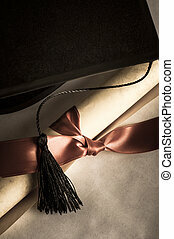 Close up of a black mortarboard with tassel hanging across rolled up parchment scroll, tied with red ribbon. 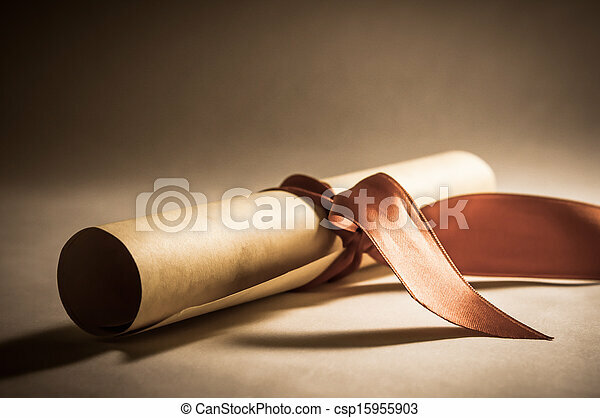 Undersaturated for vintage appearance. 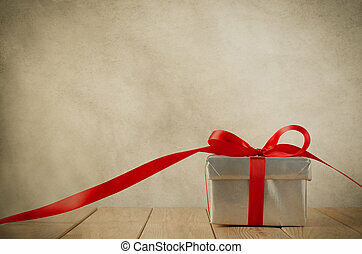 A silver gift box with red ribbon on wood plank table. 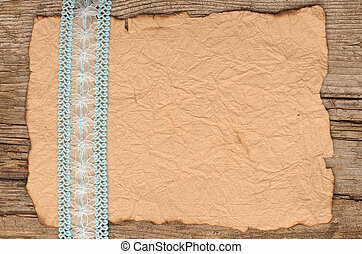 Ribbon trails off to the side and faces front. 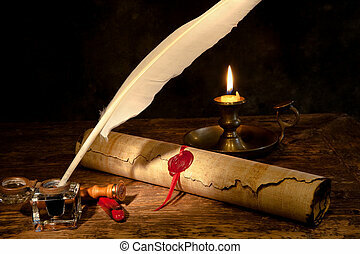 Old grungy parchment effect gives a vintage feel. 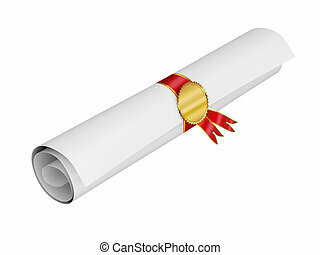 Copy space above and on ribbon. 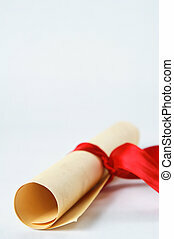 A scroll tied with red ribbon on a wooden surface in front of a book, to illustrate diploma or degree. 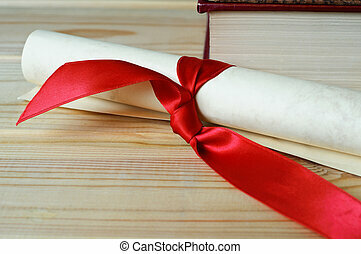 A parchment diploma scroll with red ribbon on top of a stack of old, worn, used books. 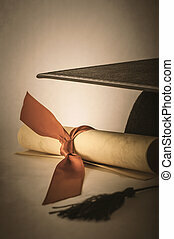 Low saturation vintage effect with soft rectangular white vignette to simulate old photograph. Overhead shot of a turquoise gift box on an old oak wood planked table, tied to a bow with red satin ribbon, with a vintage style Merry Christmas tag facing upwards. 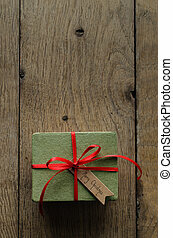 Overhead shot of a simple green gift box on an old oak wood planked table, tied to a bow with red satin ribbon, with a blank vintage style parcel tag facing upwards. Overhead shot of a turquoise gift box on an old oak wood planked table, tied to a bow with red satin ribbon, with a blank vintage style message tag facing upwards. 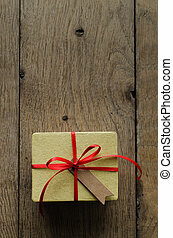 Overhead shot of a simple yellow gift box on an old oak wood planked table, tied to a bow with red satin ribbon, with a blank vintage style parcel tag facing upwards. Overhead shot of a simple brown gift box on an old oak wood planked table, tied to a bow with red satin ribbon, with a blank vintage style parcel tag facing upwards. Overhead shot of a simple green gift box on an old oak wood planked table, tied to a bow with red satin ribbon, with a vintage style 'Merry Christmas' tag facing upwards. Overhead shot of a simple yellow gift box on an old oak wood planked table, tied to a bow with red satin ribbon, with a vintage style 'merry christmas' tag facing upwards.